Posted November 14, 2013 by towni & filed under blog, Uncategorized. In the past few weeks, we’ve taken our local-offers-collecting habit up a notch. 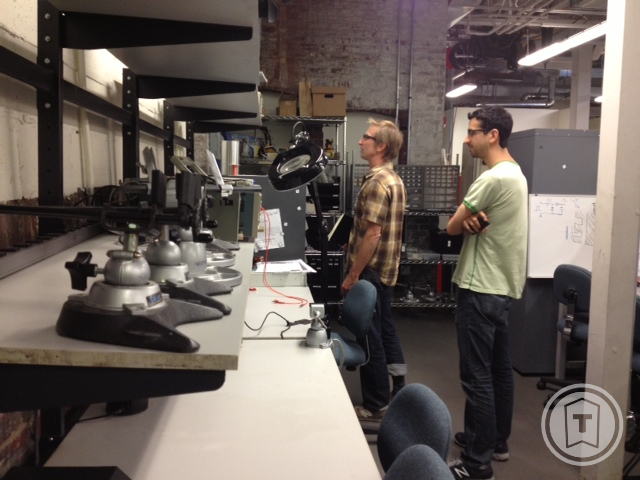 Being webby, techy, online internet guys, we knew Towni had to be built as a self-service product. We’ve been on the other end before, as business operators trying to maximize our presence within the local community. When you have to rely on someone else to handle your ad creation, administration and execution, you’re subject to their time delays, and the cost of their labor. So, the Towni Shop was engineered to give you as a merchant the ability to log-in at any ol’ time you please, and create one (or many) deals right on the spot. Kind of like gas stations, right? 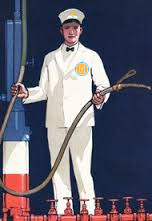 In Pennsylvania, you have the joy of pumping your own gas. In Jersey? An attendant handles that for you. So what about combining them and giving our posting merchants the best of both world? That’s just what we’ve done. 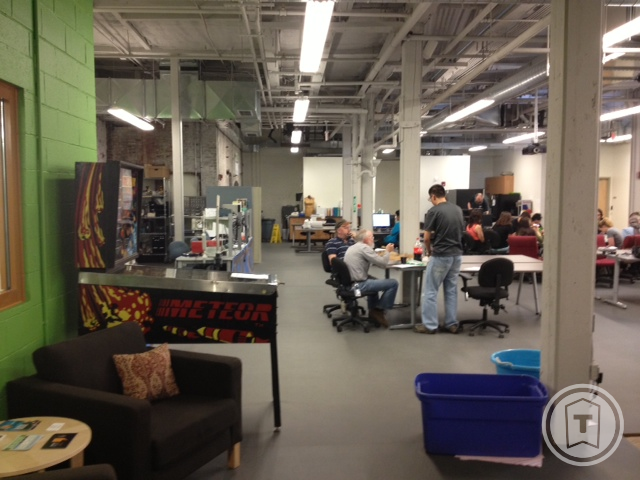 We’re now offering a “concierge” service of sorts. Simply tell us your promotion/special/deal/what have you, and we’ll take it from there. Email us, call us, text us, or send a courier on a bike with an old-timey newsie cap – whatever you please. Since we’ve begun this new tact, we’re now regularly posting offerings from about a dozen new Moorestown stores! So value your time, and if you’re day is beyond hectic and involves running a business, marketing that business, and oh yeah, picking up your kids early today so they make it to soccer practice, we hope we’ve lowered the hurdle for at least one of those. Posted October 25, 2013 by towni & filed under blog, Uncategorized. The awesome organization BALLE (Business Alliance for Local Living Economies) is teeming with terrific content about the how’s and why’s of the localism movement. So when we heard they were offering a free webinar called “Shift Your Shopping” – a discussion on how this holiday season should be our impetus to shift our shopping dollars to local businesses – it sparked an idea in our minds. Let’s have a viewing party! Calls to the Moorestown Library, Sustainable Moorestown, and the Moorestown Business Association later, and it was all set! This coming Tuesday, October 29th at 12:30 pm, in the library’s Meeting Room, the Towni fellas will moderate a live viewing party of this informative roundtable. The event is presented by Sustainable Moorestown – our community’s leading organization that promotes environmental education and sustainable economic growth. They were a natural partner to help spread the word (full disclosure – a Towni co-founder serves on the committee). 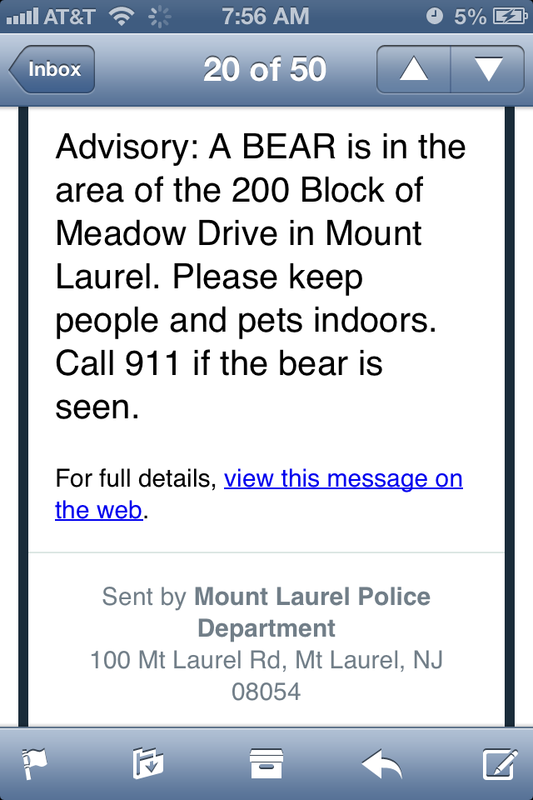 Meanwhile, the Moorestown Business Association graciously offered to help promote. We’ll convene at 12:30 pm, some quick introductions, and kick off the webinar promptly at 1:00 pm. I don’t know, I think we look good. Posted September 12, 2013 by towni & filed under blog. 1. 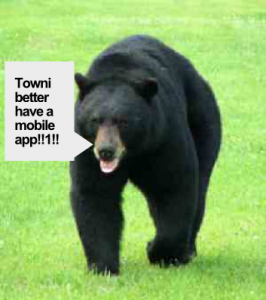 Edgar Real Estate Jumps Aboard the Towni Council! We’re so pleased, pumped and proud to announce our sponsoring partnership with a Main Street staple here in Moorestown, Edgar Real Estate. They’re 90 years old, we’re about 90 days old. It’s a connection that was meant to be! As one of our three Towni Council members (shoutout to Stevens Real Estate and CVENNELL Creations! ), you’ll see the Edgar logo at the bottom of every page on the Towni Shop – a constant reminder to our users that a certain property-slingin’ powerhouse sees a lot of value in the shop local wizardry that we call Towni! Thanks, guys! 2. GRAND REVEAL – The Towni Fund is About to Get Inaugurated! Yes, if you’re a regular reader of our blog, first of all your name is probably “Mom”, but second of all, you’re learning before anyone else: we’ll be launching a Towni Fund campaign in a matter of hours! 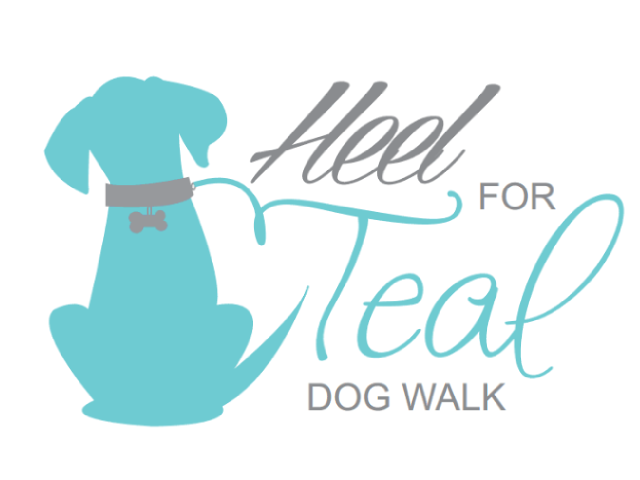 We’re super happy to be engaging with the Mary Anne Mazanec Ovarian Cancer Foundation for their upcoming benefit, the Heel for Teal Dog Walk! An awesome event for a most worthy of causes! 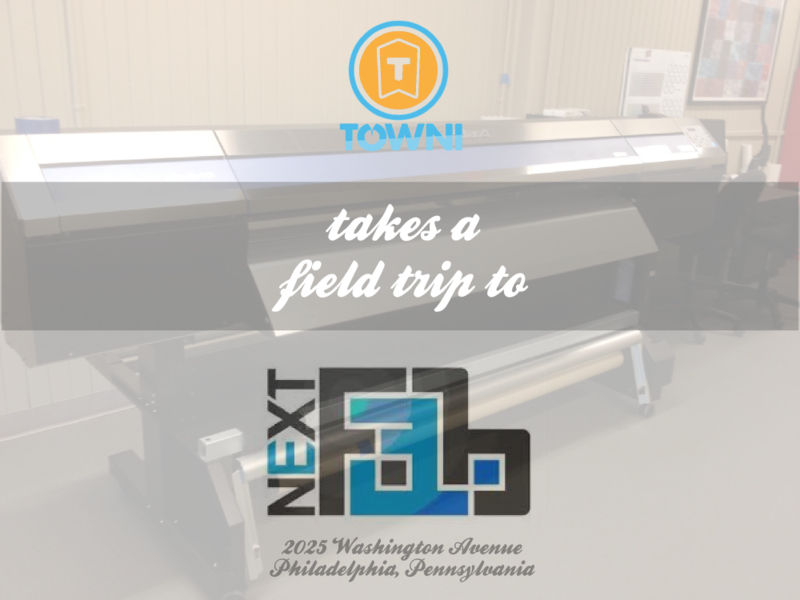 Tom Mazanec has graciously teamed with Towni to provide the registration for the October 5th event. It’ll take place at Memorial Park in Cinnaminson (on Lenola just before you get to Rt. 130). Stay tuned to the Towni Fund for more details! 3. Forget Stock Photography – Upload Your Own Images! This one’s for the brave merchants out there providing services of all varieties. 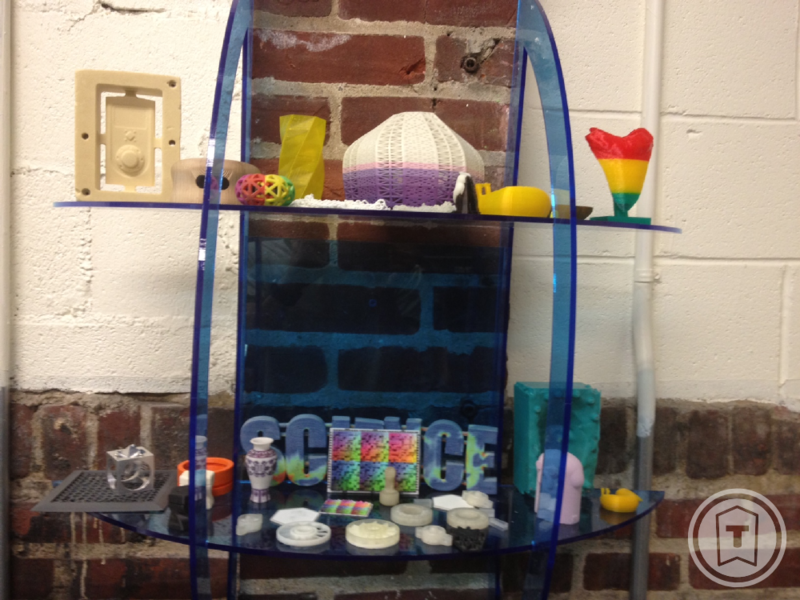 The Towni Shop, our free promotion platform, just got a little more customizable. As you surely know already, the Towni Shop is free for in-town stores to post their special, announce promotions, or even run flash sales right through the site. But it was challenging for our merchants to find images to represent their offering from stock photos. You know the kind – where a family of models holds a contrived laugh just long enough for the high-quality photo to be snapped, helping to sell…insurance. 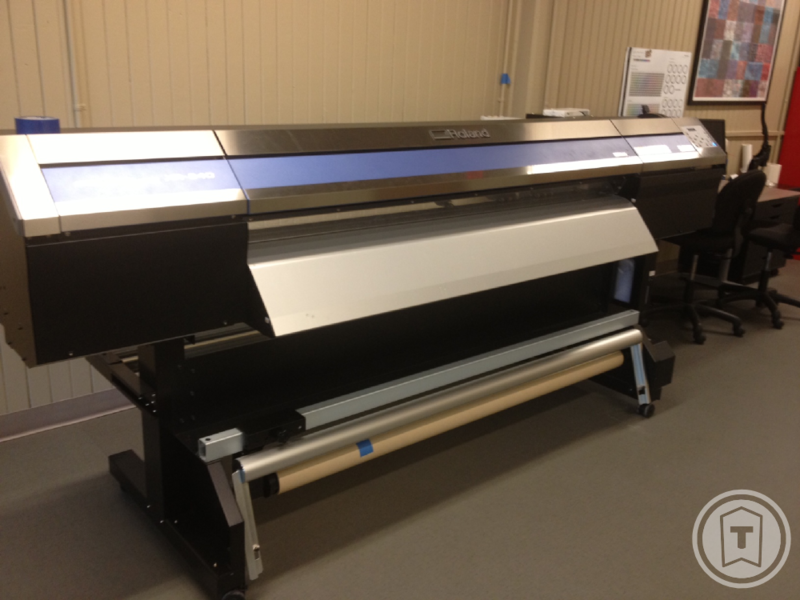 Sure, it’ll come in handy for some users, but others will need the ability to show their precise inventory. We rolled out our Image Uploader a week ago – you can now select any image from your computer, or Facebook, or Flickr, or a ton of other services. Post as you please! 4. Our Name on the Glass! Our Name on the Glass! Any startup gets a chill up their spine when their branding makes the leap from on-screen logo to on-storefront art! Our offices on New Albany got the treatment just the other day. Whatcha think? 5. How Cool is the new Town Hall Complex?! Okay, Towni didn’t really have a hand in conceiving or building the in-progress Town Hall and Library building at the corner of Second and Church. But we’re keeping a close eye on it! It now stands tall as it gets its brick facade. Almost ready for prime-time. 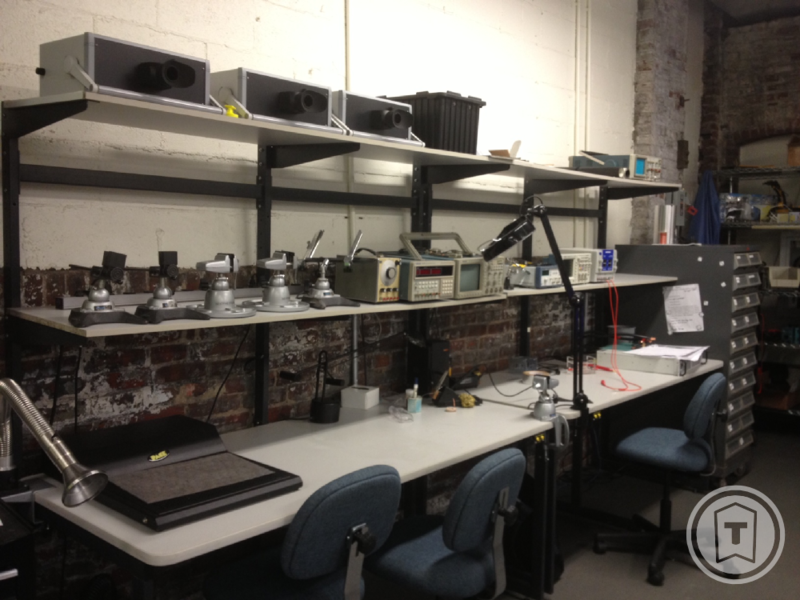 We at Towni expect to pay a lot of late fines in this building…yes, a lot of late fines indeed. We’ll try to throw you some more updates soon, without letting six weeks disappear. Much is happening, and much is on the horizon. Posted July 25, 2013 by towni & filed under blog. Posted July 22, 2013 by towni & filed under blog. Posted July 10, 2013 by towni & filed under blog. This is what local economy leadership looks like. Is it as glamorous as you pictured? Yes, there’s a killer initiative that’s on the way (and for the time being, it has nothing to do with Towni). Our efforts to make the residents of Moorestown and the surrounding communities expert local shoppers is about to be majorly boosted. Our county leaders – the five Freeholders (you know these folks, right?) 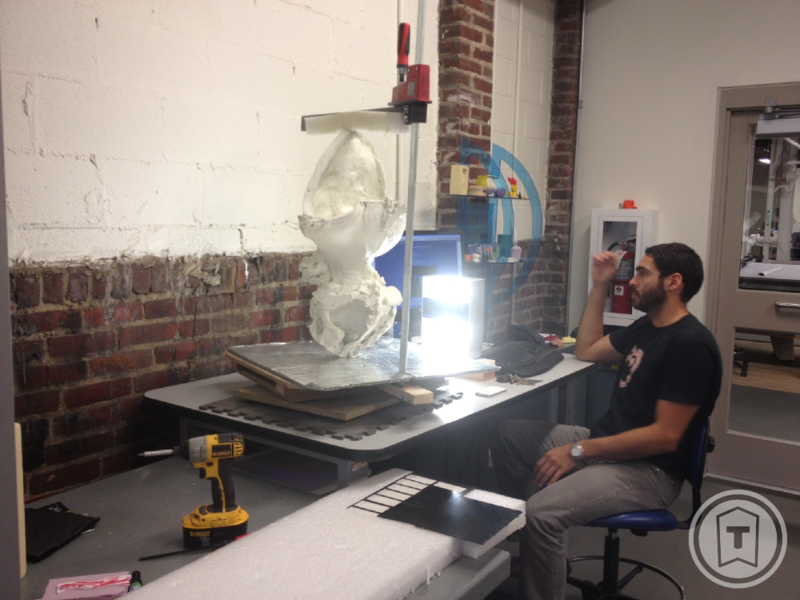 – are introducing a new program in the area. It’s called “Shop Burlington County First“. Very simply – it asks that we as consumers make a conscious choice, and even a pledge – to redirect some of our spending away from the behemoth multinationals and toward our independent shops right here in the area. By default, that makes us not just consumers, but smart, thoughtful and effective consumers. Quick stat – if each household were able to shift just $20 a month more to a local business, we’d inject $40 million into the county’s economy. That’s huge. What that also means? Jobs, tax relief, and a generally increased quality of life. local businesses can add themselves into the directory (they must belong to a business association – Moorestown, Mount Holly, Maple Shade and Bordentown thus far are on board, or else members of the Burlington County Chamber of Commerce are welcome to join as well). BurlCo Bucks! We’ll be able to buy pre-loaded cards in $10 or $25 increments. 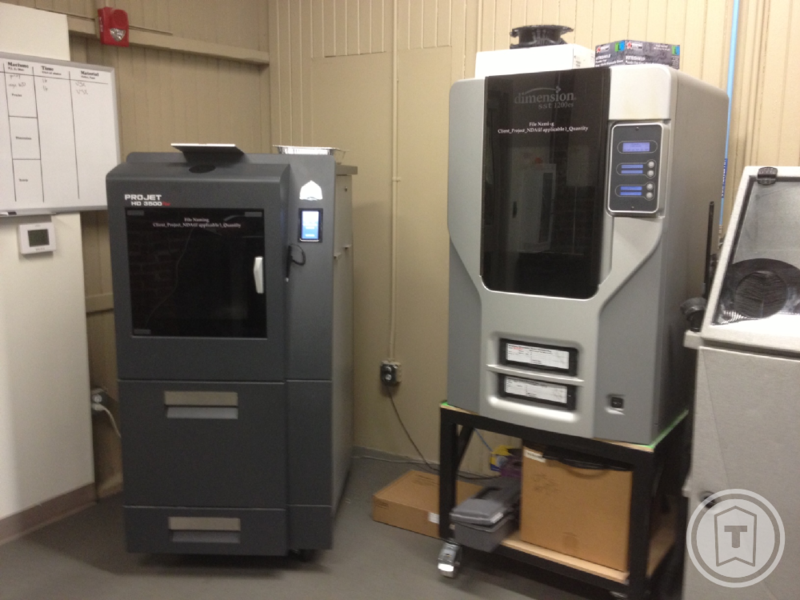 They’ll be usable at all businesses that are participating in the program. we as residents and smart shoppers are invited to pledge that we’ll be ambassadors of the shop local movement! Sign the pledge here. It’s a pretty awesome move on the part of our elected officials. 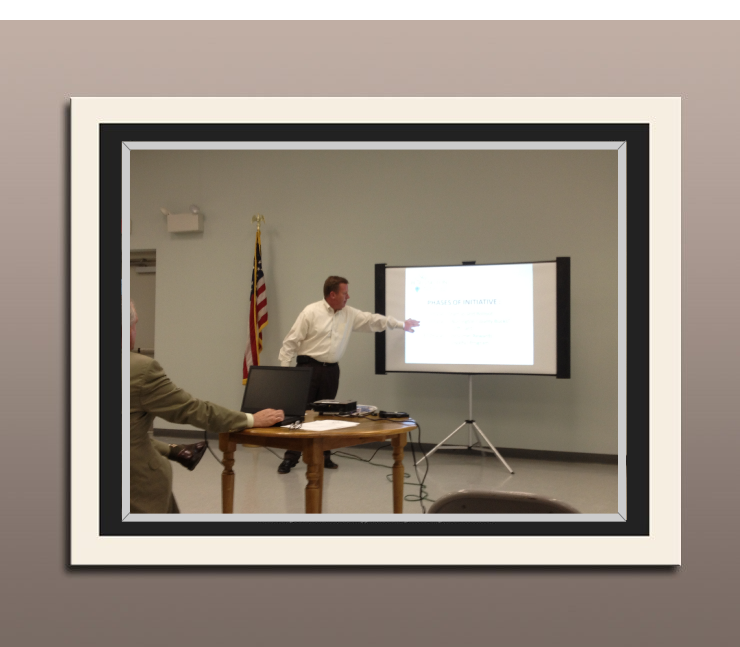 Last night, Freeholder-Director Joseph Donnelly offered up some info to a roomful of officials from local business associations, in collaboration with Kristi Howell-Ikeda, President of the Burlington County Chamber of Commerce, and Mark Remsa, the Burlington County Bridge Commission‘s Director of Economic Development and Regional Planning. There was an overall very possible vibe about this potential of it all, and I for one am ready for the ball to get rolling! You three get a high five. Towni‘s overarching mission aligns so well with this campaign. We’re really excited to be pushing for the very same benefits, in the very same geography and at the very same time. We hope we can be a supplemental force to really spread the word about this initiative and educate some people on the major impact of doing your buying right in your backyard. We’ll keep you posted as the program rolls out. Don’t expect every pic to be framed, but for the moment, it’s something worth honoring. Posted June 15, 2013 by towni & filed under blog. Man. Edison was right – launching a two-sided web-based marketplace that incorporates self-service e-commerce and crowdfunding really is challenging. I dunno, he said something like that. We’ve been running around, spitting our Towni game to anyone who will listen for a couple weeks now. It’s a mixed bag. 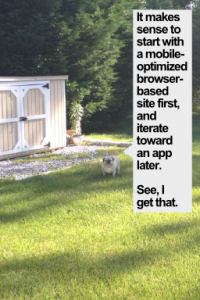 The so-so news: when they hear about it, some folks are confused as to specifically what our application does. The great news: once they see it – once they bounce around our website and realize the massive potential of a dedicated community-boosting website – their eyes light up and their brainbox fills with exciting ideas. We’re seeing it every single day. 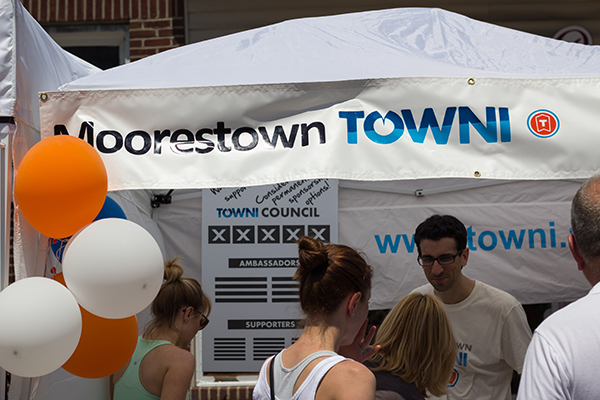 We’ve had some well-established businesses give Towni a shot – including Happy Hippo, Caryn Max Salon West, the Moorestown Running Company, Crescent Moon Clothing and Bacio Catering. We are so thankful for their digital bravery. We have many more in-town retailers that are excited to give it a try. 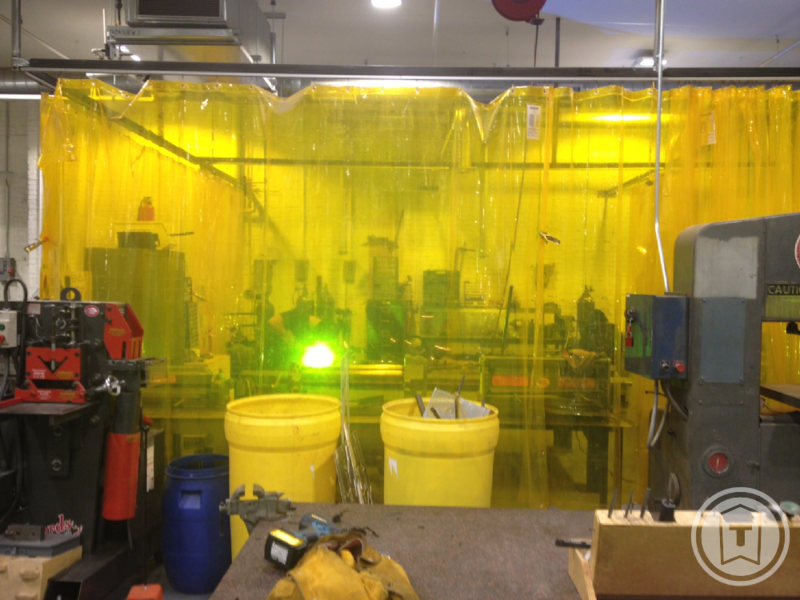 Meanwhile, our Towni Fund launch fundraiser is still churnin’. We’re halfway through, and up to $2909 – not quite on pace for our goal of $12,000, but the amount of support shown to us thus far really indicates a demand for this service, and a thoughtful support that shows this community really deserves the boost Towni hopes to give it! Whoever gets us over the $3000 mark gets an incredibly aggressive hug (but, you know, it’s optional). 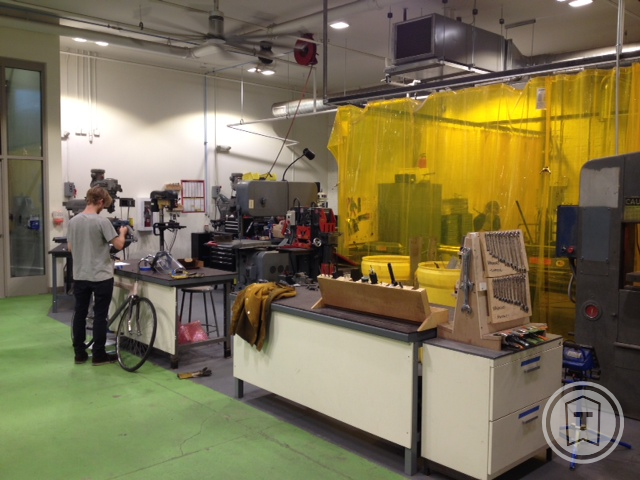 We’re also gearing up for the first week of July. The Fourth of July will always be the leading man, but there’s a strong, up-and-coming supporting role in Independents Week – a nationwide campaign facilitated by AMIBA (American Independent Business Association). It’s a 7-day come-on-everyone-shop-local-for-goodness-sake…fest. How does it coalesce with America’s symbolic holiday? Supporting local stores helps strengthen the very town it’s in. And if every town in America did that, and each local economy grew proportionately, this nation would be bolstered right at its foundation, and we can then devote some funds to building that space elevator I’m always going on about. So yeah, America rules, shopping local rules, and using carbon nano-tubes to carry a payload into low orbit rules. I digress. 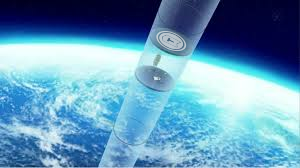 How much would it costs to sponsor the space elevator? May we borrow that amount? Back to telling people about Towni. I’m gonna leave out the space elevator pitch for now. Posted June 7, 2013 by towni & filed under blog. 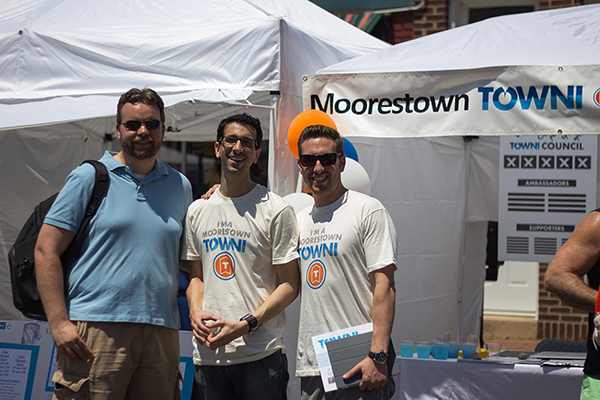 Yes, on June 1st, Chris and I attended the 37th Annual Moorestown Day. 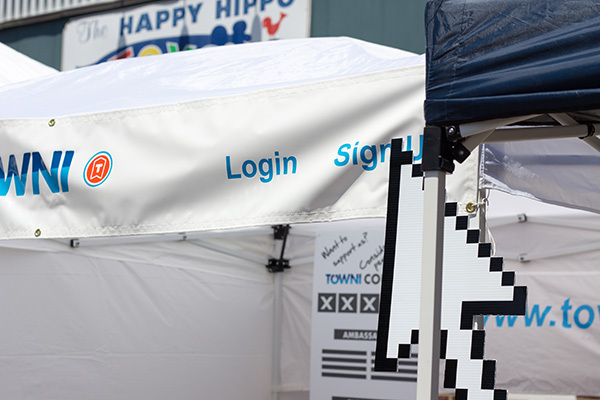 We got there bright and early, set up our tent, blew up some balloons, hung the banner…the whole deal. It was hot out – 112 degrees Fahrenheit, as I’ll tell the story many years later. But we stuck it out, and answered more questions about the pronunciation of our name than what our service is all about. I imagine “Apple” didn’t have to worry about that question too much. We were excited to make many new contacts, see a steady stream of familiar ones, and actually had a pretty awesome time. 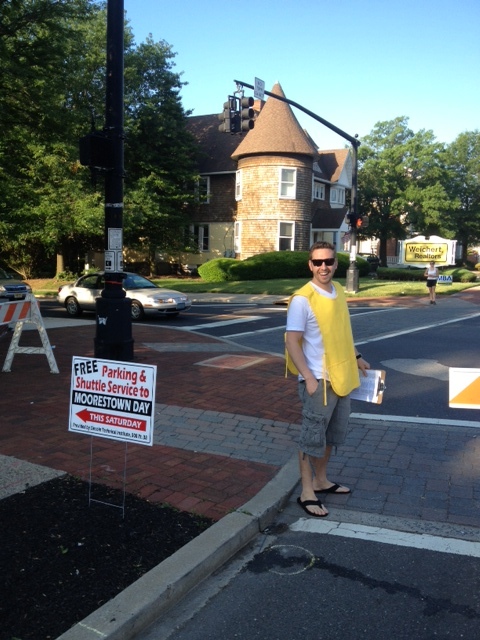 To show our community spirit, Chris donned a yellow “Event Staff” vest and directed the 7 AM traffic. He looked nothing short of silly, and I wish someone got a pict–oh wait, you know what, I think I did. I directed the 4 PM exiting traffic, but sadly no cameras were around to bear witness. Well just because June 1st is here and gone, doesn’t mean our mission is complete. It’s only just beginning. We have lots of work to do to make this thing flawless or darn near, and we may go hoarse spreading the word to every dissatisfied merchant looking for ways to reach their target crowd, every resident who realizes our town is stronger when we patronize those within our own borders, and every do-gooder with a dream that wants to take on a project and needs the community’s backing. Those are Towni’s prime ambitions, to address those concerns. Posted May 27, 2013 by towni & filed under blog. 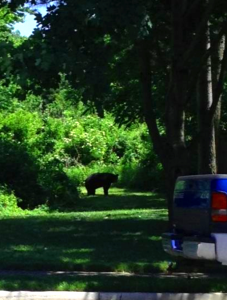 Knowing that to be approximately behind my house, I had a sudden sense of “wait, a BEAR? 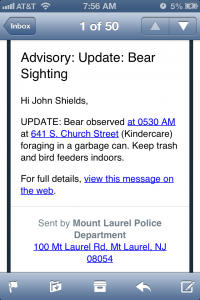 !” Chris and I were safely at the office 4 miles north, so this news merely led to many poorly-executed puns about honey and Goldilocks and I think I even said something about the Cubs being in town to play the Phillies. All unfunny, all predictable. 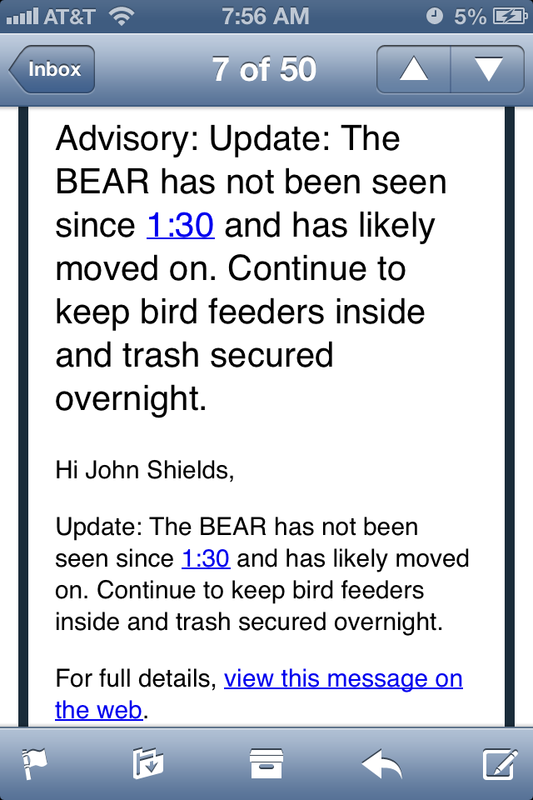 With just 5 days until Towni presses the “On” button on our metaphorical machine, now I have to worry about an American black bear (Ursus americanus) eating my dogs and messing with my already-needing-to-be-replaced bird feeder. We have promotional materials still to create, rigorous testing underway – and a twelve-foot-tall rabid grizzly with nothing to lose is going Godzilla through town. I mean, basically. Yeah, that’s what I thought. Movin’ on. Poor guy’s gotta miss his family. Probably just wants to get home and watch the new season of Arrested Development on Netflix like everyone else. I felt safe again, knowing I could get back to the business of building a world-class community-supporting application for the 15 square miles where I spent my youth. KinderCare, of all places. A daycare center for our community’s sweet, innocent kinders. But worse – that’s three doors down. 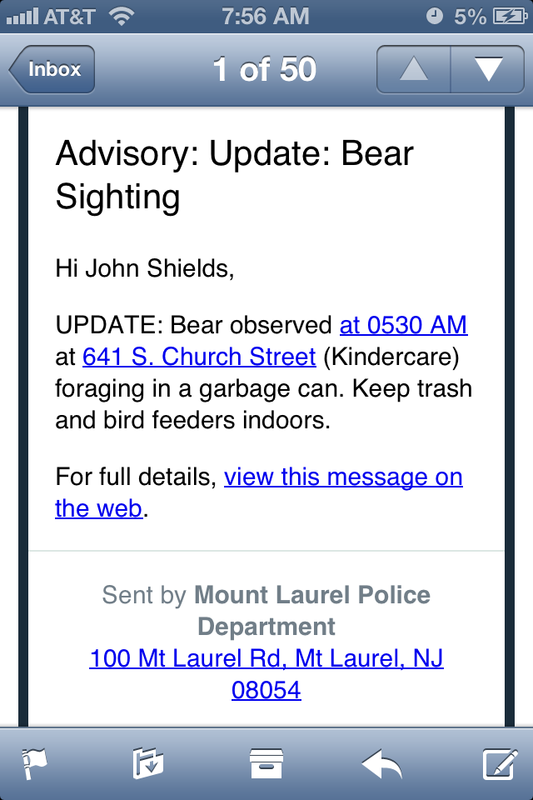 For all I know, the bear strolled right through my backyard, fished through my trash cans, set up my bean bag game and neatly put it away, before heading to the next house to de-humanize them, too. 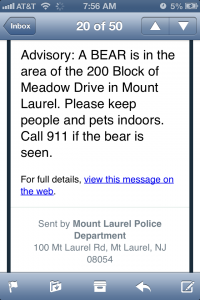 Look, bear. No amount of intimidation is going to slow down the Towni train. 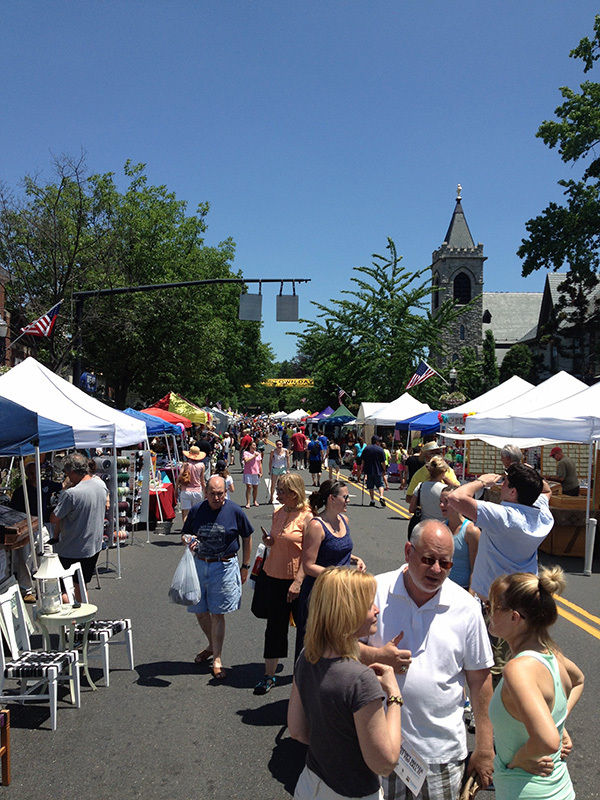 We’ll be at Booth 7, right in front of Happy Hippo, on June 1st for the 37th Annual Moorestown Day whether you like it or not. Let me guess, you only shop Big Box? You don’t think the independently-owned merchants deserve a dedicated platform to get their services in front of town residents? 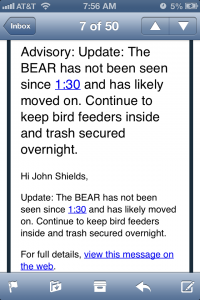 Typical bear. Until then, I’ve asked Olivia, our ten-year old pug to stand guard. She’s no threat to win a doggie IQ test, but she sure is brave. Posted May 20, 2013 by towni & filed under blog. No, it’s cool. They have wifi. With launch less than two weeks away, you might say that Chris and I are in the zone. 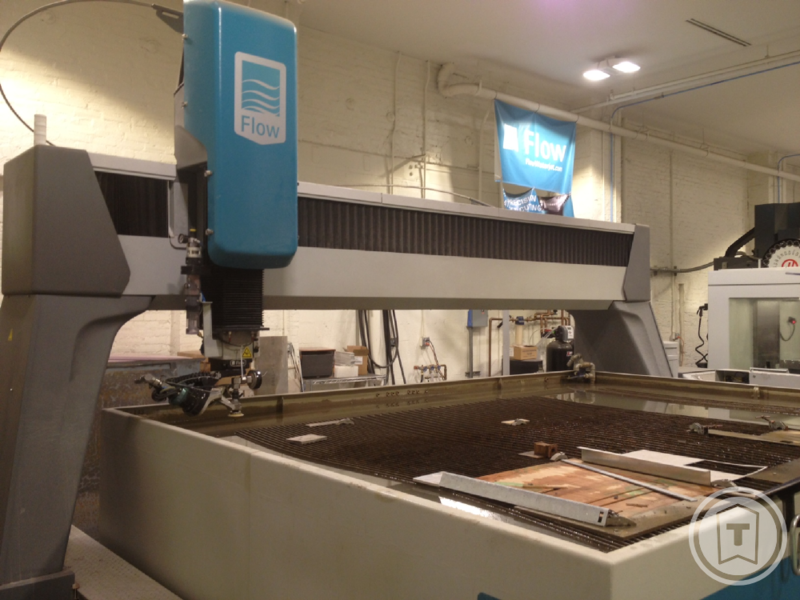 Or you can say our work has entered a state of zen-like “flow”. Or you could say both the quality and quantity of our work output makes Elon Musk look like a lackadaisical beach bum. We walk in, are politely welcomed by a fresh-faced hostess, but stroll right past said hostess and make a bee-line for the largest unbroken string of bar stools and plant ourselves in the mathematical center. “Hey guys,” says a not-particularly-shocked-to-see-us Courtney, Lauren, Lauren, Nikki, Lisa, Maria, Erin, Boomer or Brian. We’re offered beers (check) and food menus (check). Food menus arrive, are immediately flipped over, displaying a gloriously blank canvas primed for the most ridiculous ideas ever to be scrawled. 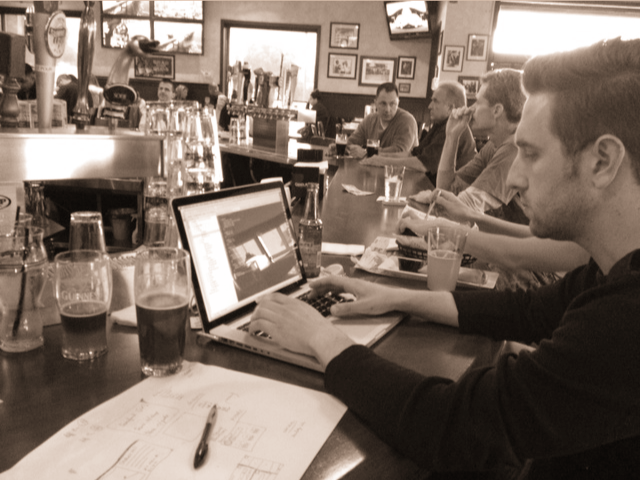 Commence list-making, site-mapping, wireframe-sketching and occasional beer-spilling. I heard it’s exactly how Edison operated. For the record, that’s Chris experimenting with AngularJS in an effort to solve a top-level cross-property navigation enigma we’ve been working on for months. I’m accumulating database fields and data points for the interactive map application. Which all probably sounds impressive, but I assure you PhotoHunt is just out of frame and may have – if memory serves – gotten a fair bit of use.